I relearned this piece after a hiatus of about 40 years. 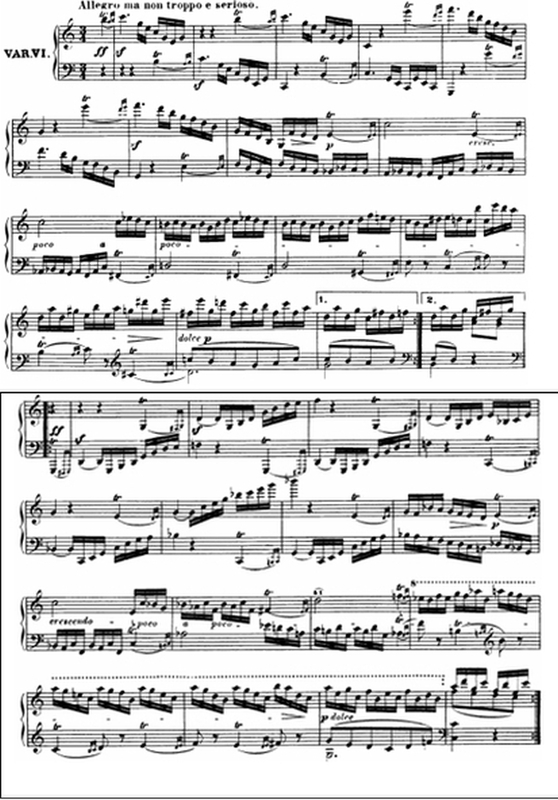 This antepenultimate sonata is a product of Beethoven’s very late period and is compact and concise almost to an extreme. The entire first theme is only 8 bars lasting only about 11 seconds! The entire movement is but 4 pages – one each for exposition, development, recapitulation and coda. It was probably nearly 40 years ago that I first encountered the Diabelli Variations. Although his most famous work in this genre, they were not the first I heard and it was another couple of decades before I listened to them critically. I do however remember what first drew me to them, and that was the back story of their creation. The version of the story that I first learned was simplified and probably at least partly apocryphal, but it appealed to my understanding of Beethoven’s sometimes irascible character and his attitude to anyone whose artistic sensibilities he considered beneath him, which would have included almost everybody. Essentially the story is this: In 1819 minor composer and music publisher Anton Diabelli approached 50 of the best known contemporary Viennese composers and asked them each to provide a single variation on a theme of his own, which he intended to publish to benefit widows and orphans of the recently ended Napoleonic Wars, and of course to benefit his own newly started publishing business. 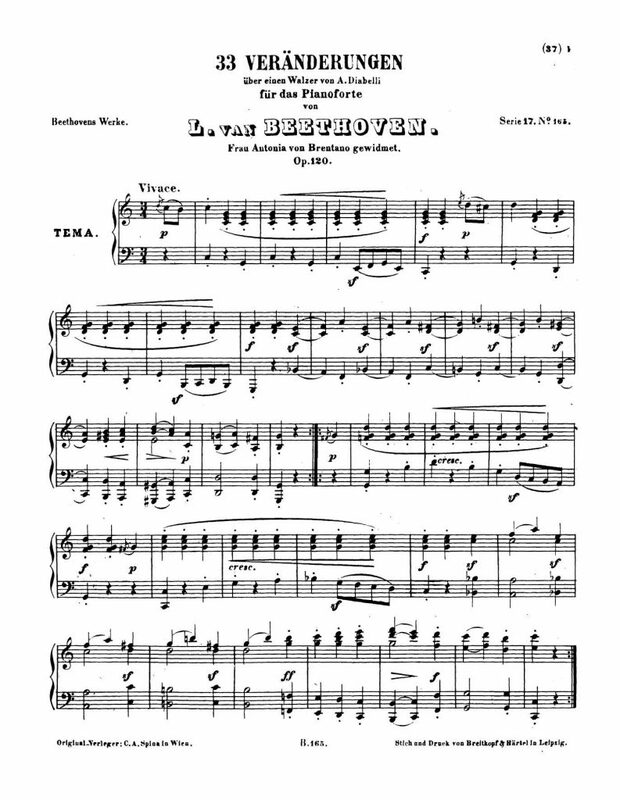 Upon receiving this request Beethoven, incensed at his inclusion in a group of composers whom he considered well beneath his own artistic talents, but also highly dismissive of Diabelli’s shabby little beer hall “Waltz” theme (he called it a Schusterfleck or ‘cobbler’s patch’) declined the offer and instead wrote 33 variations of his own which became his final great work for the piano, and one of the greatest of the entire piano repertoire. So how bad is the theme? After over 150 years of more or less ridicule by scholars, a few have recently suggested that’s it’s not as bad as had been previously thought. From Beethoven’s perspective though, it was almost child like. 4 bars of repeated C major chords (in their most simple form – C- E – G) with a simple bouncing bassline using the same three notes of the chords, and then 4 more bars of the same in G major. This is followed by a simple 4 bar upward stepwise progression (called a rosalia) from F through G to A and finally a standard 2-5-1 cadence to G which leads back to the repeat. The second half of the theme is sort of a mirror image of the first, starting with G and using the same mechanisms (including the rosalia) to return to C major. There’s really no melody as such, and the harmonic progression is as simple as they come, bouncing back and forth between the tonic and dominant. 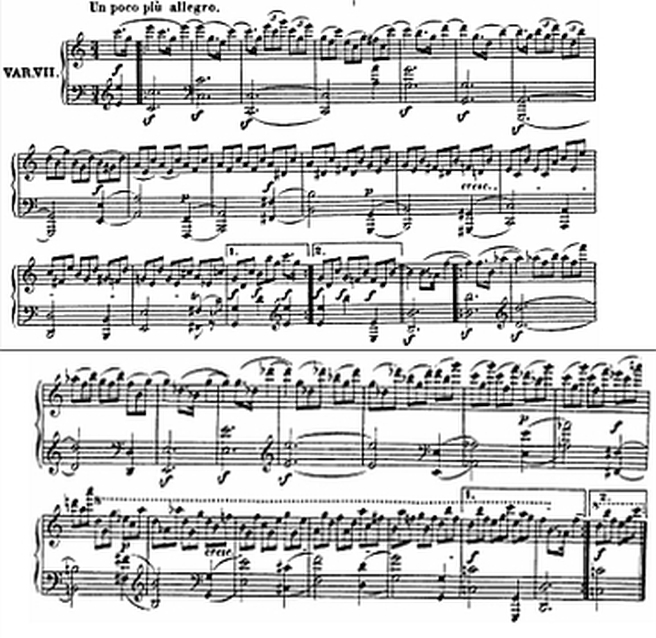 Diabelli’s one trick is the rosalia, which Beethoven no doubt would have considered cheating, as it is perhaps the least inventive way of moving harmonically to the final cadence leading back to the dominant. It may have been this feature that he was referring to when he used the schusterfleck descriptive. After initially disparaging the theme, Beethoven seems to have comprehended the possibilities that it offered. The extreme harmonic and melodic simplicity represented almost a blank canvas for him to fill in as he saw fit. And using it he was able to create some of his most sublime, as well as some of his most sarcastic creations. He did this largely by taking individual bits of the theme and building variations around them, starting with the opening turn in the right hand. This feature isn’t even an intrinsic part of the melody, but rather merely an ornament decorating the first note. Other fragments used are the descending 4th/5th in the first/fifth measures, the repeated notes, and the 3-note ascending sequence used in the rosalia. In some of the variations, this fragmented motivic material is treated almost contemptuously, in others it is used to build short tone poems of great beauty and emotional depth. Often, Beethoven seems particularly to be mocking Diabelli’s little schusterfleck, by replacing it with harmonic complexities far beyond a mere rosalia. The great pianist Alfred Brendel has written, “The theme has ceased to reign over its unruly offspring. Rather, the variations decide what the theme may have to offer them. Instead of being confirmed, adorned and glorified, it is improved, parodied, ridiculed, disclaimed, transfigured, mourned, stamped out and finally uplifted”. We present here to the world Variations of no ordinary type, but a great and important masterpiece worthy to be ranked with the imperishable creations of the old Classics—such a work as only Beethoven, the greatest living representative of true art—only Beethoven, and no other, can produce. The most original structures and ideas, the boldest musical idioms and harmonies are here exhausted; every pianoforte effect based on a solid technique is employed, and this work is the more interesting from the fact that it is elicited from a theme which no one would otherwise have supposed capable of a working-out of that character in which our exalted Master stands alone among his contemporaries. The splendid Fugues, Nos. 24 and 32, will astonish all friends and connoisseurs of serious style, as will Nos. 2, 6, 16, 17, 23, &c. the brilliant pianists; indeed all these variations, through the novelty of their ideas, care in working-out, and beauty in the most artful of their transitions, will entitle the work to a place beside Sebastian Bach’s famous masterpiece in the same form. We are proud to have given occasion for this composition, and have, moreover, taken all possible pains with regard to the printing to combine elegance with the utmost accuracy. 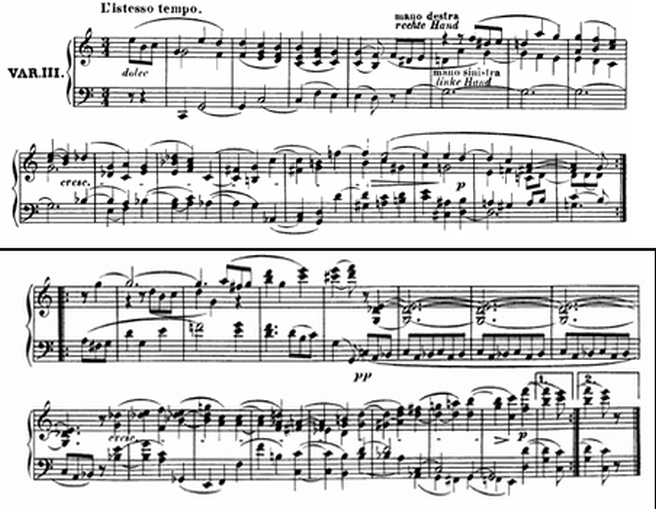 Beethoven immediately switches from the 3/4 waltz rhythm to 4/4 – an unusual step that makes it crystal clear that he will not be beholden to Diabelli’s intentions. While he began composing these variations in 1819, he had only completed 23 of the final 33 before he laid them aside for several years, only returning to them in 1823. This 1st variation is one of those composed at the later date but inserted at the very beginning of the set, obviously a deliberate decision. So why a march and why here? 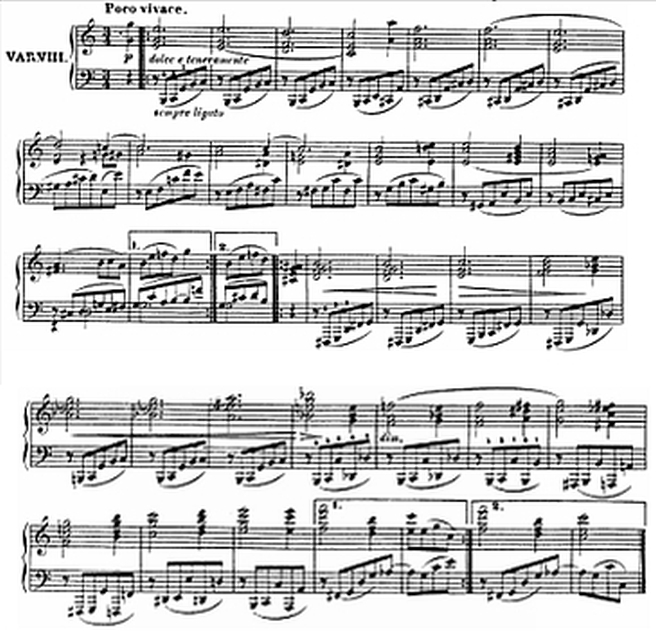 A great deal has been made of the final, 33rd variation and its strong resemblance (especially at the very end, in the coda) to the last movement Beethoven’s final piano sonata Op. 111, composed the year before he finished the Diabelli set. At the very end of the variation, he seems to be consciously quoting himself. 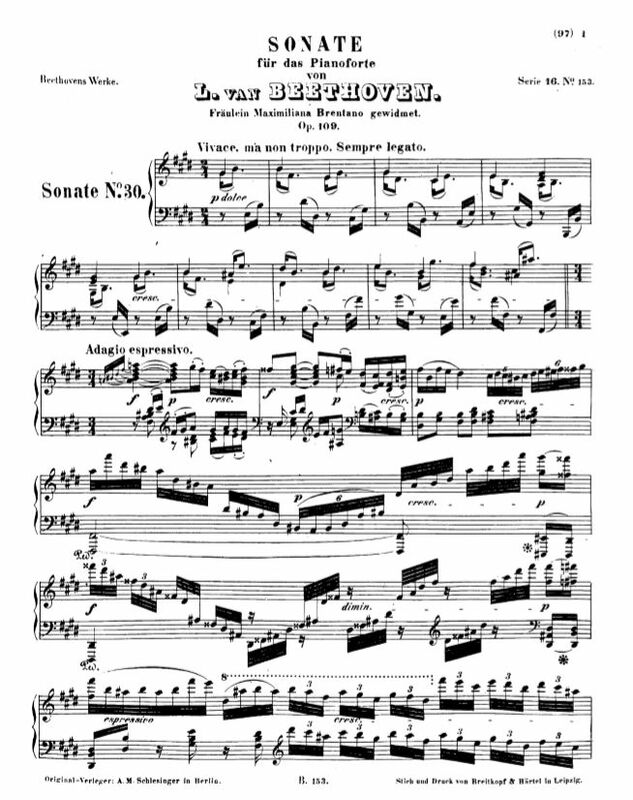 It has occurred to me that Beethoven’s very first published piece was a set of variations on a march by Dressler. Perhaps this was also a conscious decision? Pure speculation on my part! Back in 3/4 time, this variation retains the repeated C and G chords from the theme, now syncopated between the left and right hands. According to William Kinderman’s highly detailed study tracing the composition the variations through Beethoven’s sketchbooks, this was one of the last to be completed. The syncopation reverses twice in the schusterfleck section of the second half of the theme, apparently (according to the sketchbooks) a last minute modification made by Beethoven. The repeat of the first half is deliberately omitted, although Schnabel famously included it in his recording. 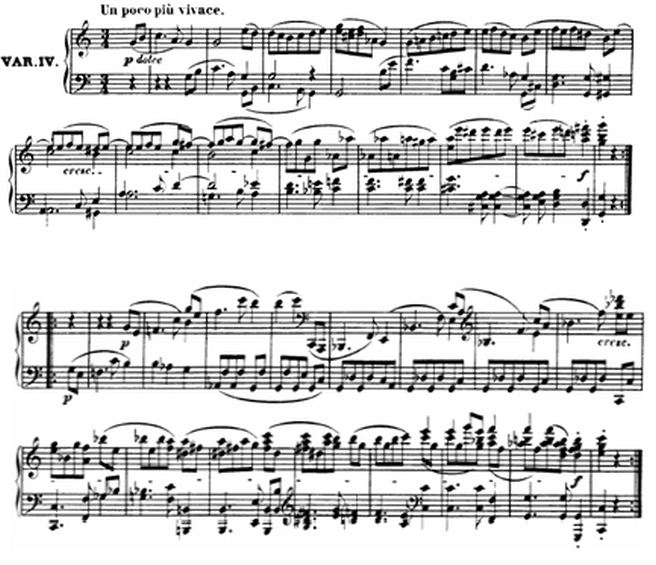 This was originally 1st variation, before Beethoven added what became variations 1 and 2. It is much more melodic than either of the preceding variations, or indeed of the theme itself. The opening three notes are themselves a sort of variation of the turn that begins the theme, and as in the theme they are repeated in the 5th measure. In the 2nd half of the variation however they are repeated, canon-like, in all of the first few measures. The effect is one of acceleration towards something climactic, but instead what follows is a remarkable departure from the original harmonic structure. 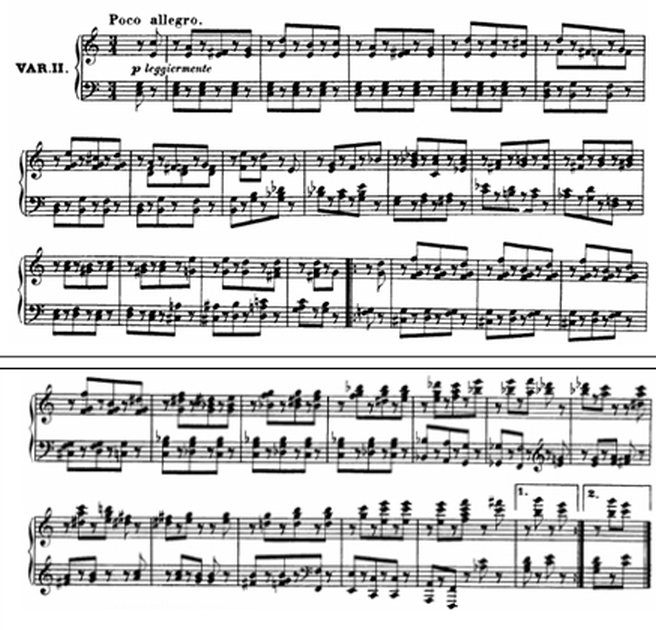 Here Beethoven replaces the C tonality with a diminished seventh chord built on Db, and all harmonic motion pauses while the little 3 note turn figure is repeated 8 times in the left hand. 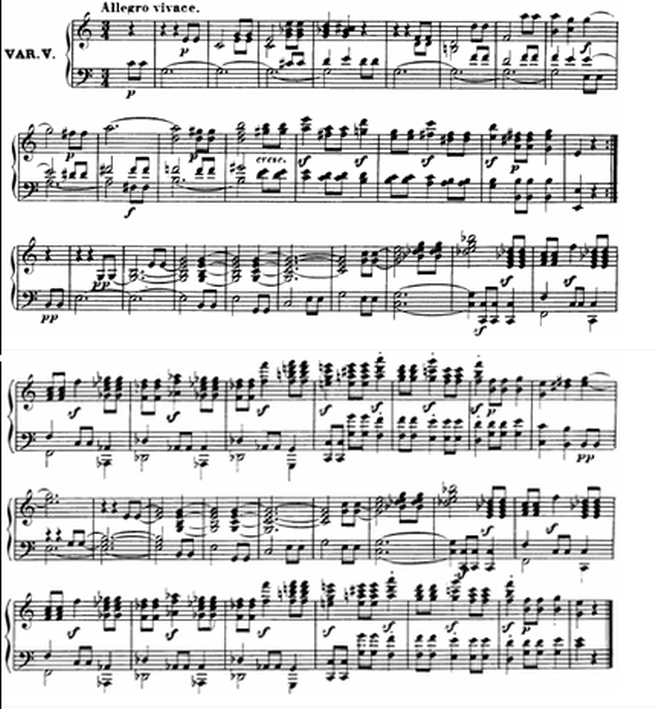 In his original scheme (where this would have been the first variation), Beethoven is announcing right up front that he will not be bound by the limitations of Diabelli’s theme, and further that this Db diminished chord will play an important part in later variations. Also noteworthy is the way the rosalia passages are harmonically enhanced beyond anything that poor old Diabelli could ever have imagined! This whole variation is written out in four-part harmony, and Beethoven’s use of this idiom has often reminded me of his string and vocal quartet writing. 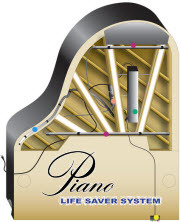 His later piano music frequently uses this technique. 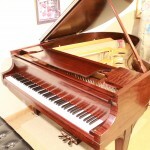 The last several variations have been building to a virtuosic climax, and here it is. 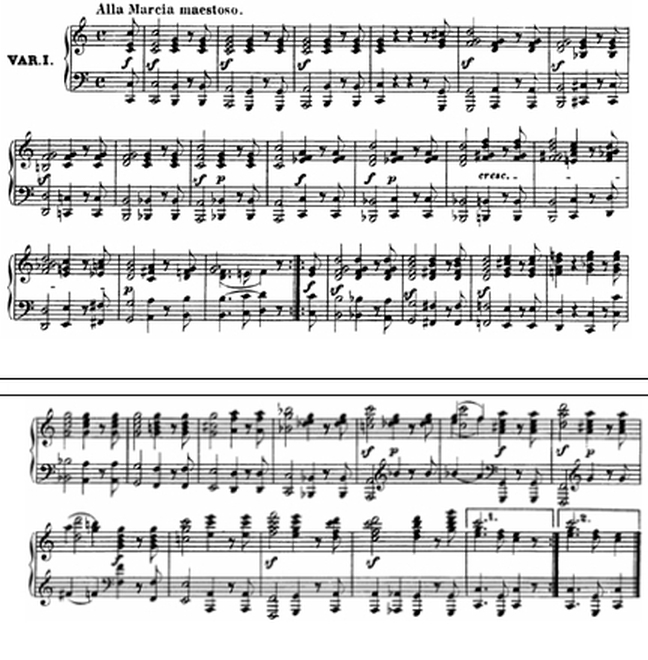 Widely separated bass octaves alternating forte and piano with treble triplets (almost at the extremes of Beethoven’s keyboard) race headlong towards the ending. Note the descending third in the bass at the beginning, echoed at the beginning of the following variation. This is one of my favorites and the second that I learned, long before I tackled the whole set. I was first drawn to it after hearing back to back recordings of it on the Deutsche Grammophon “Great Pianists” sampler disc by Artur Schnabel and Maria Yudina, and being intrigued by these two very different interpretations. Beethoven begins this variation as he did the previous one, with a falling third, but contrasting the frenzied energy in #7 with this gentle tune based upon the ascending schusterfleck sequence in the theme. Here, instead of a single rising wholestep, the bassline walks upwards continuously in each half.